In Douglas Adams' clever sci-fi novel "A Hitchhiker's Guide to the Universe," Arthur Dent is astonished to learn one morning from his (alien!) buddy Ford Prefect that not only his pleasant English home, which he adores, but the entire planet Earth is to be demolished to clear a path for a galactic hyperspace expressway. Zapped. Erased. That very day! As a west-side Salt Lake child of a certain era (the 1950s and early 1960s), and recalling a wide-eyed age (my first dozen years), I can relate. 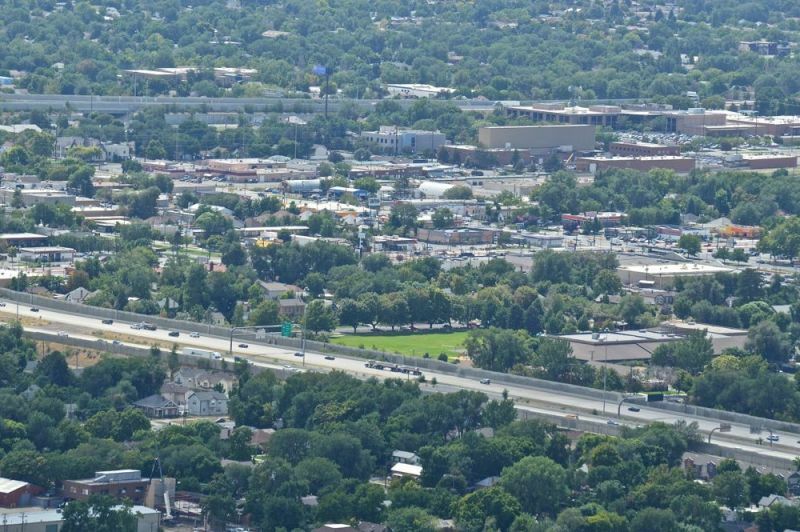 When I was a small-for-his-age lad, oh, about 50 years ago, the interstate freeway system came to Utah and, more particularly, through urban and industrial western Salt Lake City. To clear a path for the I-15 superhighway, the core of my little neighborhood was sliced smack through the center. This was a slow-motion demolition. It took years. First, a bunch of buildings were abandoned and razed. Then came an elongated mound of gravel and dirt, stretching north and south. And finally, an elevated and paved freeway was born. To be sure, my childhood "world" was not particularly large. It consisted basically of two 10-acre Salt Lake City blocks, plus key structures just across a few of the streets. To me, the principal thoroughfare was First North, although North Temple, to the south, would probably be considered my little planet's "Main Street." That is where the major stores, motels, a small movie theater, bowling lanes and steady traffic were. The familiar neighborhood included the two blocks also demarcated on the east and west by what were then the streets Fifth West and Seventh West. That was it. Important outliers on the frontiers of my sense of neighborhood are many. The main entrance to the Utah State Fairgrounds (now the Fairpark) was just over two blocks west – at the end of our street. Busy railroad yards and tracks rattled and boomed two or so blocks to the east, a notable barrier between "us" and central Salt Lake City, though we were linked to downtown and Temple Square by a fascinating viaduct on North Temple. The then-white Catholic Our Lady of Guadalupe Church sat one block away, to the north. West High School seemed a palace of education to me, regally rising due east, beyond the railroad tracks, on what is today 300 West. My older siblings all attended West High. My brother Phil was president of his senior class. 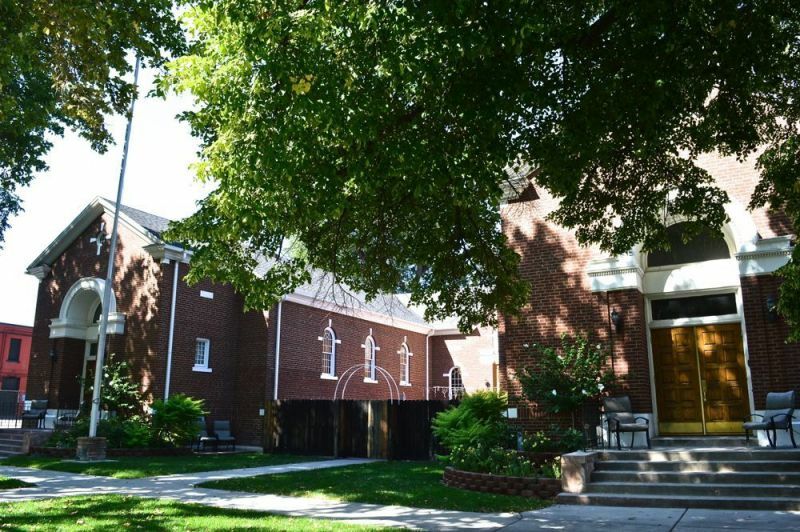 A key neighborhood gathering place, though, for my family and closest friends, our LDS church meetinghouse – the Mormon pioneers' 16th Ward – sat on Fifth West to the east of where I lived with Mom (Phyllis) and Dad (Don) and my sisters and brothers: Elaine, Paul, Darlene, Phillip and Dawna. Bill and Gracie's mini-market squeezed onto one corner of Seventh West and First North, to the west. Jackson Elementary School and Jackson Jr. High School perched in a tree-lined, park-like setting directly across the street from our house. A number of these details are meaningless today. Most houses remain – at least, those that didn't vanish before the rise of the freeway. The familiar schools across the street are gone, replaced by a new elementary. My church is now a mysteriously upscale, fenced residence. Few of the old businesses remain, at least as they were. North Temple, after a rise and decline, is suddenly a modern thoroughfare, and a key light-rail train route to the airport. The I-15 of my childhood already has been re-engineered and almost entirely rebuilt. Even the streets were re-enumerated in 1972, several years after my family moved away. North Temple, originally a "0" latitude on the city grid, became "100 North," while keeping its historic name. West Temple, once a "0," is now "100 West." And so, the city decided, "Fifth West" would henceforth be simply 600 West, and good old "First North" is 200 North, etc., etc. As a result, my still-remembered childhood emergency mantra is gobbledygook. Just in case I became lost (or was kidnapped?!? ), my parents had me memorize, and repeat, a few key facts. I was to find and tell a police officer, "My name is Ray Lynn Boren. I live at 733 West First North. My phone number is EL5-1606." I dropped the "Lynn" while attending Jackson Elementary School, in fifth or sixth grade, as I recall. For awhile I retained the middle initial "L.," mimicking my father and oldest brother, who did that too, also with the letter "L." The address for what was once my house is now 733 W. 200 North – plus 735, for it is now apparently split into apartments. Few will remember that EL once stood for the telephone exchange "ELgin." This was a child-sized world. But even today it is rife with memories, and dotted with more than a few landmarks. A drive or a walk along its streets brings much of it all back. 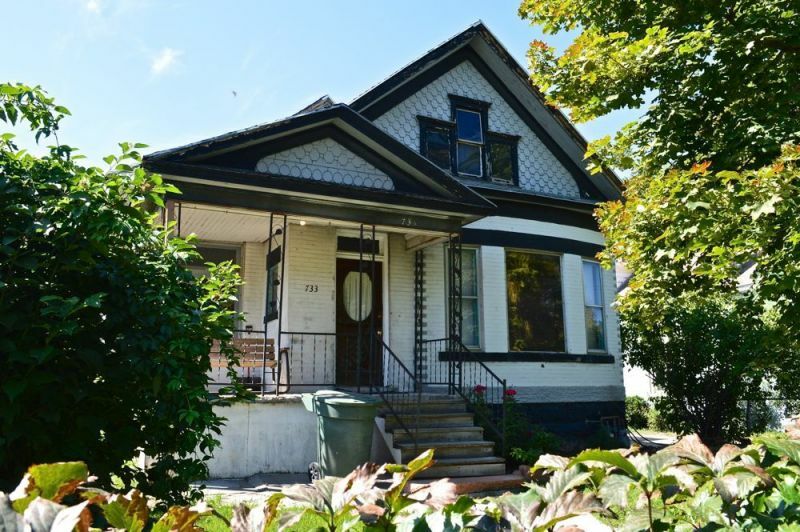 The transformations in one old neighborhood are enough to make one feel like a time traveler. Maybe that is because we ARE, if we live long enough: true travelers through time. Now: A century-old brick house, my family's long-time, long-ago residence is painted white. According to a real estate Web site, it is now a "2-bed, 2-bath" rental advertised as being ideal for college students, perhaps those attending LDS Business College east of the railroad tracks at the Triad Center. Now: Jackson Elementary School is a single-story schoolhouse with a spacious playground, including strips where once a few houses stood to the east. Today it is noted for the multicultural diversity of its community, and is occasionally in the news because of arts projects, including a goal that all students are to be taught to play a musical instrument. Then: This was the "Jackson neighborhood" when I was a boy, not the "Fairpark neighborhood," or the "Guadalupe neighborhood," or part of the Northwest Historic District, as it is sometimes referred to today. Jackson Avenue split our block. Jackson Elementary School was the towering core of the area, a three-story brick edifice with a steeply pitched roof. The year "1892" was stamped large on the wall near the rooftop, which I remember because that was the year my Grandpa Ottley was born. By my time, the more modern Jackson Jr. High School was attached to the east side, a rare double campus. The junior high no longer exists. I attended both, from kindergarten to the beginning of 8th grade. Is the school's name a tribute to Andrew Jackson, or maybe a pioneer family? I don't know. When school was out, Mom let Elaine and me roller skate on the sidewalks and play on the new monkey bars, for we lived just across the street to the south. I vividly remember Elaine and the Sanchez kids and I hanging there, laughing and singing "I Want to Hold Your Hand" at the top of our lungs – though I had no idea that the song heralded a worldwide mania for four English lads, The Beatles. Now: A boarded-up, shack-like, wood-paneled building on the southwest corner of the intersection, the low-roofed building has a red and white "CLOSED" sign on the brown corner door. Now: The Free Church of Tonga occupies the building on the northeast corner of the intersection of today's 200 North and 800 West streets. The exterior brick is plastered and painted a sandy buff tint with white borders, so its appearance is somewhat changed. On Sundays, lovely choral melodies drift into the neighborhood. 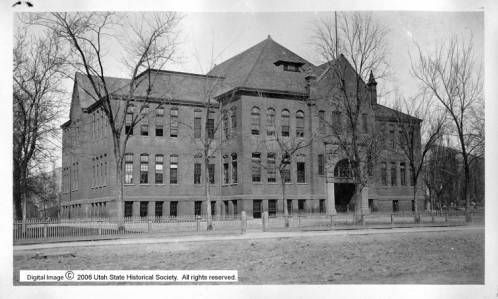 Then: The John D. Spencer Library was a branch of the Salt Lake City Public Library system, a small brown brick edifice with white columns bordering the main entrance. I can remember thumbing through the wonderful variety of books – and visiting my sister Dawna, 13 years older than I, when she worked there in her teens and through high school. The library opened in 1921 but closed its doors in 1965. Now: On a platform of earth and concrete, probably the equivalent of two or three stories high, vehicles of all sorts zoom overhead on modern I-15, the major north-south interstate highway in Utah. The swish and rumble is almost always audible at street level on today's 700 West. I can even hear it build through the day from where I live now, a mile to the east on Capitol Hill above the city proper. Then: There is a snippet of silent family film – my dad never shot more than a few seconds at a time – taken when Elaine and I were quite little, walking hand in hand toward the movie camera along the sidewalk on First North (200 North!). A low, level pile of dirt rises in the background. That was I-15 being born in the 1950s. An even earlier memory, I suppose, is of a walk with my father, pre-dirt pile, among abandoned houses and small apartment buildings to the east of our house, probably en route to church. Windows with shattered panes gaped blindly, and it all seemed rather ghostly. Later, when I saw photographs of bombed cities from World War II, such images seemed startlingly familiar. I-15's corridor chopped through our neighborhood. Scores of houses and buildings on Salt Lake City's west side were demolished. Progress seemed to shout: "Make way for the future of transportation, the freeway!" In those days, the great mounds of gravel were allowed to settle for what seemed like years. For a while, a long, corrugated culvert pipe, with asphalt laid on the interior bottom, cut through the mid-city hill on First North (today's 200 North), allowing residents like us to get from one side to the other, west to east and vice versa. It was usually dark and smelly in there. Transient folks used it as a urinal. Litter and kicked beer bottles clattered as we negotiated the tube. Elaine and I vividly remember the thump thump thump of pile drivers pounding huge support timbers into the sides of the freeway mound. We didn't really know what the big, clangorous machines were; we called them "hole-in-the-headers." And during one construction lull, my big brother Paul – nonchalantly brave and bound to break the occasional rule – escorted me up onto the as-yet-unpaved unnatural hilltop. We hoisted a store-bought paper kite into the air and watched it flutter and fly over the traffic-free wasteland, nothing in its way. Now: Recently, a friend from my teens posted on Facebook a set of photos of a "by invitation only" dining out experience, one of several he and his wife have enjoyed at unusual locations. One photo seemed familiar to me – a doorway. I sent him a note asking if it was taken outside an old church just north of North Temple on 600 West. Yes, he said, it was. Now a fine residence of many spacious rooms, long ago it served as the 16th Ward of The Church of Jesus Christ of Latter-day Saints. 7 – Se Rancho Motel and Se Rancho Lanes (both sides of North Temple at about 650 West). Now: Large, new apartment complexes (CityFront on the south; CityStation on the north) and businesses occupy either side of North Temple Street, just east of the raised freeway, where once stood the Se Rancho Motel (on the north) and the Se Rancho Lanes bowling and swimming pool complex (on the south side). Then: A curious point of pride: Whenever we were tooling about the state on rides or visiting family elsewhere in Utah, I was always enthused by the sight of one of Se Rancho's small highway billboards. I would think, "That's MY neighborhood!" Urging travelers to consider the Se Rancho as a preferable place to stay in Salt Lake City, the small, colorful and plentiful signs, featuring a cowboy on horseback with a lasso over his head, seemed to be everywhere. They could be spotted along U.S. 40 to the west and east of Salt Lake City, and on U.S. 89-91 to the north and south. Some stood in place long after the motor inn disappeared. The similarly named bowling lanes across the street were a more recent addition, to my childhood mind. They were owned by the Sine family – Betty Lou was for a time my Sunday School teacher. I remember that my brother Paul, seven years my senior, was incredibly tan and fit in his early teens from frequenting the pool in summer. I had moved away from Salt Lake City, but returned to bowl there late with some of my friends on the night of the day we graduated from high school. 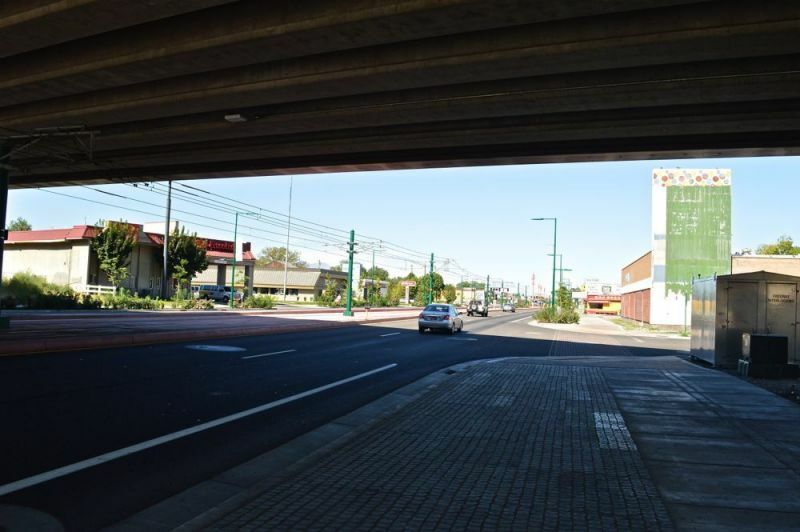 Now: An overpass deck with massive steel beams still spans busy North Temple Street – but it is a different bridge from the one built there when I was young, for the freeway corridor was extensively re-engineered and rebuilt in the 1990s and early 2000s. Then: The freeway's construction was a seismic event in our neighborhood in the late 1950s and early 1960s. The base mound of gravel rose in increments; the "hole-in-the-headers" (pile drivers) rhythmically pounded away, like drumming giants in the near distance. Eventually the new roadway spanned North Temple. Silver-painted beams stretched high overhead, supported by muscular concrete pillars ... upon which soon appeared the first graffiti I ever recall noticing. The scrawls included a notorious four-letter word. At the time I had no idea what it meant. I didn't hear the Naughty Word of Naughty Words uttered until a few years later. But this is also the site of what was for me a "historic event." 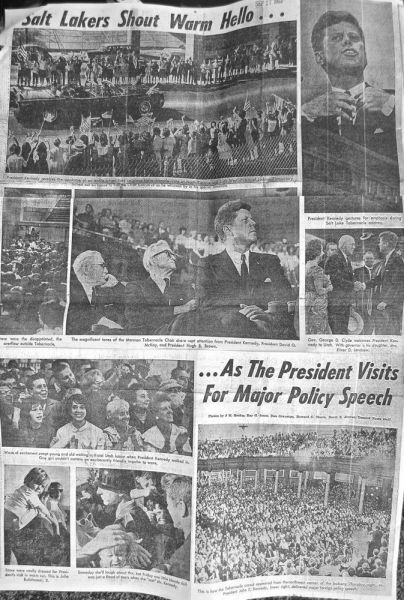 In September 1963, President John F. Kennedy visited Salt Lake City. As he was leaving for the airport on Sept. 27th, our teachers at Jackson Elementary School trooped several classes to spots below the I-15 deck. Most students lined the north side of the road. Others took positions along the covered median on the south side of the westbound traffic lanes. Thirty years later, in the archives of the Deseret News where I worked, I came across a beautiful black-and-white image by photographer Ray Jones capturing the event, along with a photo-filled newspaper page upon which it was featured. 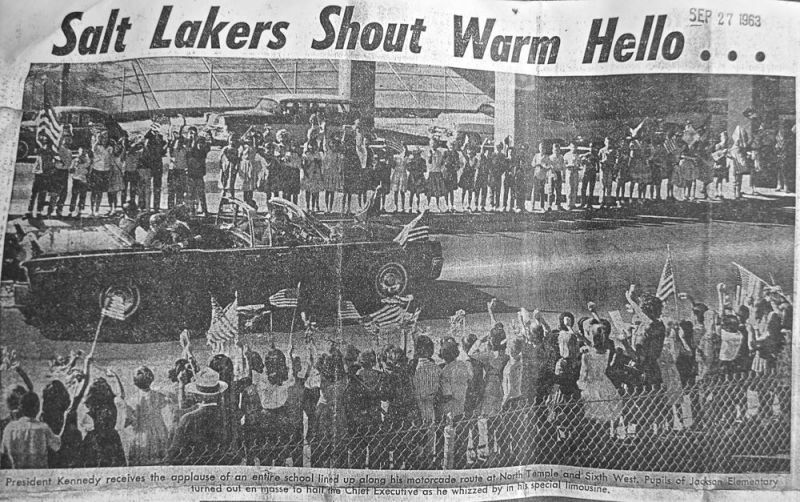 "Pupils of Jackson Elementary turned out en masse to hail the Chief Executive as he whizzed by in his special limousine" is how the newspaper caption described it. And there I am (or so I believe), my shirttail hanging out, sandwiched by my tall friends Randy and Susan (as I recall), along with other excited, flag-waving classmates. My sister Elaine is there, too, waving joyously as the president passes by in his open convertible. 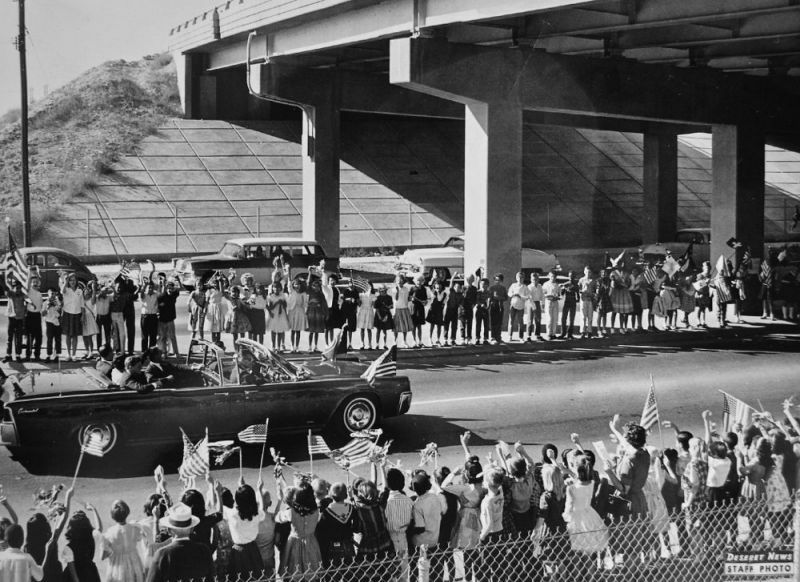 Just two months later, on Nov. 22, 1963, JFK was shot and mortally wounded in Dallas, reportedly riding in that same dark-blue, modified Lincoln Continental motorcar. The loss and tragedy felt incredibly, unbelievably personal. Now: An empty corner warehouse and commercial building, this was most recently a Hostess/Wonder Bread thrift shop. The nationally known bakery recently went out of business. Delivery trucks are still parked behind the building. The brand – makers of Wonder Bread, Twinkies, Hostess Cup Cakes and other treats – has been purchased and a few of the products are said to be headed to a store near you. I haven't seen any yet, though. Then: Back in the day, this was a neighborhood Safeway grocery store. I well remember the smell of fresh-baked bread there, Lucerne dairy products and Shasta pop (my favorite was a fizzy orange). Very rarely – and maybe just this once, considering ... – my mom would send me there to pick up something she needed. One time a bully accosted me on the store's east side, demanding any change I had. Another older neighborhood boy, Evan Larsen, chanced to see me crying as I passed his house on my way home. When he heard what had happened, he escorted me to the Safeway, confronted the pudgy robber and got my mother's money back. Thanks, Evan! For some reason, Safeway later abandoned the Utah market entirely, though it still thrives elsewhere. The Hostess store eventually occupied the space, keeping Safeway's signature sign pillar, attached to the building's southeast corner but at least a full story taller, painting it green and white, with the familiar Wonder Bread red, yellow and blue "balloons" at the top. The paint is peeling badly at this point, but the Wonder Bread colors are still discernible. Now: And what a now! 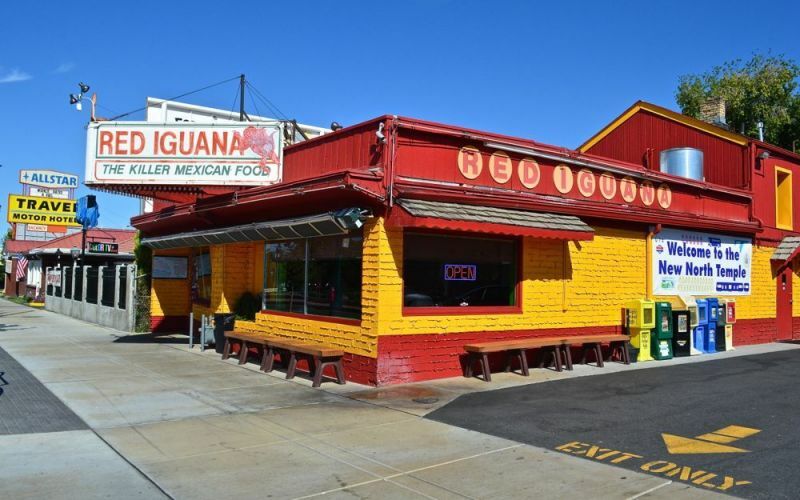 Today this small cafe, painted in brash shades of red and gold, is the Red Iguana, one of Salt Lake City's renowned eateries. A sign over the sidewalk promises "killer Mexican food," and it earns raves. Because seating is limited, it is typical at lunch and dinner times to see daunting lines of hungry people outside. I've been privileged in my adulthood to eat there – and the kudos (on the Web, from both locals and notables, such as the band Los Lobos and chef/author/TV personality Guy Fieri) are deserved! Then: During my childhood, this was the Poor Boy Cafe. It seemed even smaller then, tucked between the busy Safeway parking lot and Scotty's colorful motel. Its brickwork was curious to me, for the cafe was painted a gleaming white and the mortar had been allowed to squish outward as a textural effect. I don't ever recall going inside. Now: Signs today advertise this as the "Allstar Travel Hotel" and "Allstar Travel Motor Lodge." But white letters on the red roof tiles proclaim the motel to be "SCOTTY'S," and the pool area harkens to another day. 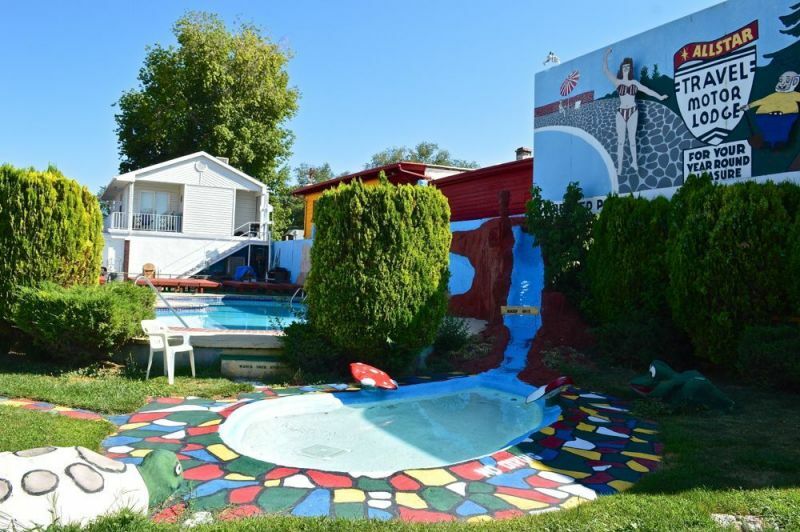 Then: For a child, Scotty's classic motor lodge seemed like a fantasy, a mini-Disneyland visible from the sidewalk and from North Temple, but just out of reach ... unless one was a traveler, of course, with a chance to stay there for the night. But the Borens lived straight through the block to the north, so we never did. A family of sculptured, brown concrete bears stood just inside the fence. Bears and dwarves and a pretty girl in a swimsuit beckoned from a forest scene on a billboard overhead. A small waterfall seemed to come out of the cafe wall next door, and a scene featuring the Colorado Plateau's mitten-like buttes and an arch decorated the background to the larger of two swimming pools. Though a bit worn by time's passage, most of these elements are still visible outside the Allstar. Postcards and images of, as one card claims, the "world's most photographed motel" can be seen on the Web, on Flickr and eBay. Now: Set in the in-step of I-15 and west North Temple Street, this is still the Jackson neighborhood, for Jackson Elementary School and block-splitting Jackson Avenue remain. Utah Transit Authority's new Trax line courses down the middle of North Temple, linking downtown and Salt Lake City International Airport, miles to the west. After years of construction, the new light-rail system seems to be rejuvenating the district. Then: This was our block, our "home territory." As my sister Elaine and I got a little older, year by year, we were given free reign – well, modified free reign – at first along our street, First North (now 200 North), and later, with special permission from Mom, to actually walk ALL THE WAY AROUND THE BLOCK! We couldn't step off it or cross any streets, but it was an occasional ADVENTURE! Once, as I tooled about in my little blue foot-pedal-powered toy car near the corner to the east, a policeman stopped his cruiser at the curb. "I hope you're not going too fast," he said. "I might have to give you a ticket." I was probably 4 or 5 years old. I scurried home, excited that perhaps he meant to give me a ticket to a movie theater downtown! I had no clue.... Another time, a summer afternoon rainstorm was followed by bright sunshine and a brilliant, arching rainbow. Elaine, who is 17 months younger than I, remembers that our cousin Janice was visiting. Janice was my age. We had been trying to sell lemonade from a tray-stand on our front lawn before the storm hit. I doubt that we sold a drop. In the soggy sun after the deluge, Mom gave us permission to walk around the block on this wondrous day. We proceeded clockwise, as I recall, mostly walking on the curbing, like tightrope artists. That was our routine. We passed Safeway and Scotty's fantasy motor lodge, the old Pioneer Station post office on 800 West and the homes of families we knew, and made the turn back home. By the end, our feet and shoes were sopping wet from occasionally stepping and stomping in the rain-filled roadside gutters. We were very, very happy.